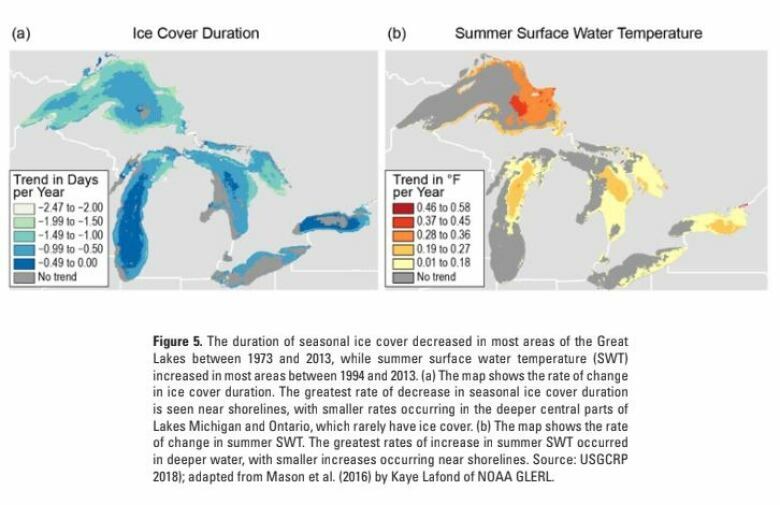 The changes caused by declining ice cover on the Great Lakes are pretty bad, but it's not all doom and gloom. Ice cover on the Great Lakes has declined in the past 40 years with average ice coverage dropping up to 75 per cent, depending on the lake. "We rely a lot on the Great Lakes for shipping ... so an ice-free Great Lake is not a barrier to shipping. 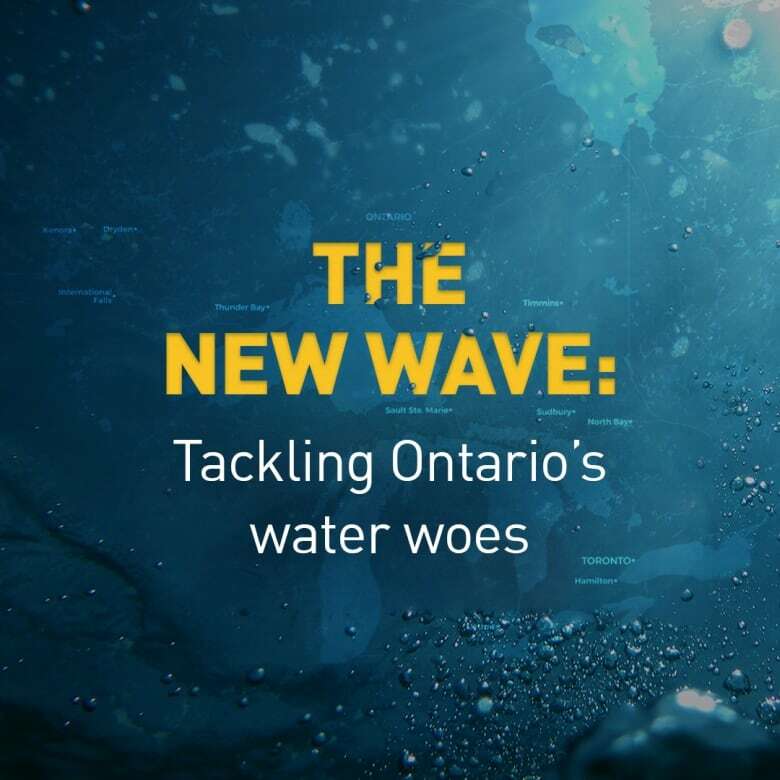 But beyond that there are a lot of negatives associated," said Mike McKay, the executive director for the Great Lakes Institute for Environmental Research (GLIER), based at the University of Windsor. "Storm events and runoff promote erosion, but so does wave action," said McKay. "Ice cover prevents waves from crashing against the shoreline." According to the Great Lakes Climate Change Report, published by the Environmental Law and Policy Center, Lakes Superior, Huron and Erie are losing ice cover more quickly than the other Great Lakes, but all lakes are down on average. "Exposed shorelines increase the vulnerability of beaches, shorelines and bluffs to erosion," said the report. "Lack of ice cover is associated with further warming during summer months." "When wind mixes the lake, we will tend to get more wave action, which will scour the shores," said McKay. "Add a cap of ice to the lake and it negates the effect of wind. Ice will prevent coastal erosion." He says the erosion is especially severe in areas which have bluffs and the carving away of the bluff eventually encroaches on housing and fields. One effect of declining ice cover that McKay says most people don't think about is lake effect snow because it is generally produced by wind blowing across open water. The Great Lakes region saw a 10 per cent increase in the frequency and intensity of heavy rain and snow events in the last 110 years. Without ice cover, these snowfalls will be even more dramatic. "Ice serves as an important ecosystem protector," said McKay. "Studies looking at long-term data in our municipal water intakes, and pairing that up with ice cover, show that years where we have mild winters we have increased nitrogen and phosphorous in the water." 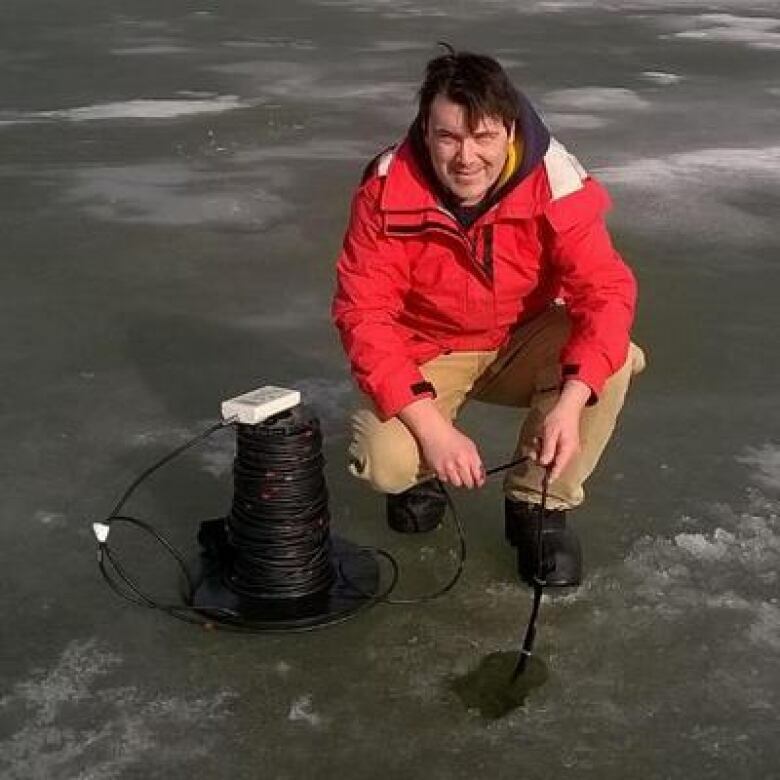 According to McKay, a covering of ice allows those nutrient particles to settle to the bottom of the lakes, which he says is a good thing. "We view them as being buried," he said. "They're not very useful. In general we can think of this as being a sink for nutrients." Even though they're called nutrients, phosphorus and nitrogen can be harmful and are often associated with runoff from agricultural lands and contribute to algal blooms. According to the Great Lakes report, the higher levels of E. coli bacteria found in the Great Lakes and the toxic algal blooms common in related waterways could affect drinking water systems in surrounding areas, like what happened in Toledo, Ohio in 2014. But there's good algae too. "Blooms of algae that grow under the ice, they're not the same blooms that we normally think of," said McKay. "These are nutritious algae whose energy gets transferred through the food web, eventually into fish, making Lake Erie a very productive fishery." According to McKay, this good algae needs ice to set up their life cycles. "I think we could argue part of the reason the [Lake Erie] fishery is so productive is because we have this good algae," he said. McKay argues that a decline in ice is also bad for Canadian identity. "Ice is really a cultural identifier in this country," he said. "We don't have to look any further than our five dollar bill." At Wilfred Laurier University, people across North America report back on how many days their backyard ice rinks are useable. "The same factors affecting ice cover are affecting this national identifier," said McKay. "Ice fishing too, it's a cultural identifier for many communities and lucrative for the economies of many communities as well." 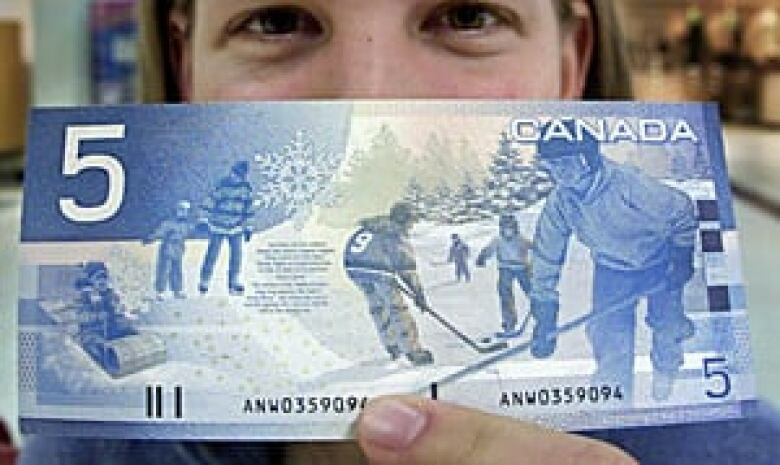 An iconic hockey scene takes up one side of the Canadian $5 bill. "Making this important link to our own lives, our own communities, is important to bring attention to this issue," said McKay. "There's so much uncertainty in terms of climate simulations," said McKay when asked what comes next for the Great Lakes. "It will continue warming over the next several decades." 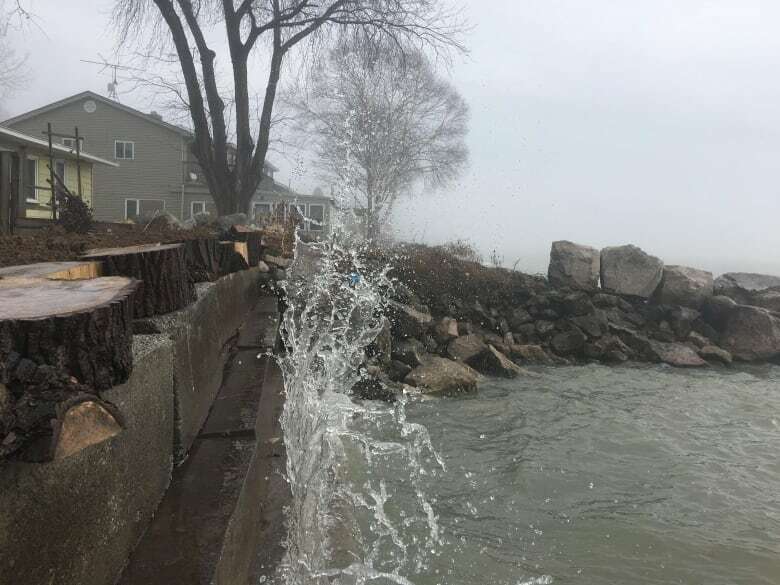 He predicts that Lake Erie could soon be ice-free during the winter months — but he says the Great Lakes can bounce back. "We're not doomed if there's no ice cover," he said. "The Great Lakes, time and time again, have shown they're resilient." According to McKay, the lakes are accustomed to coming back from adversity. "There will be a new normal."